Hypersensitivity reactions are abnormal reactions of the immune system that occur in response to exposure to otherwise harmless substances. These reactions encompass true allergic and other non-allergic reactions and their severity can range from mild to life-threatening. The most severe hypersensitivity reaction is called “anaphylaxis” and this allergic reaction usually begins immediately after exposure to the allergen. Hypersensitivity reactions in and around the mouth may produce a wide range of clinical appearances including redness or whiteness of the mucosa; swelling of the lips, tongue and cheeks; and/or ulcers and blisters. Stomatitis: Typical signs of stomatitis are redness and swelling that may involve any part of the mouth (see Right) including the tongue, roof of the mouth, cheeks, and lips (cheilitis). There is occasional formation of blisters and ulcers. Affected individuals may complain of a burning sensation and mouth sensitivity to cold, hot, and spicy foods. Lichenoid reactions: These lesions resemble lichen planus and consist of slightly raised, thin, whitish lines that blend together to form a lacelike pattern. 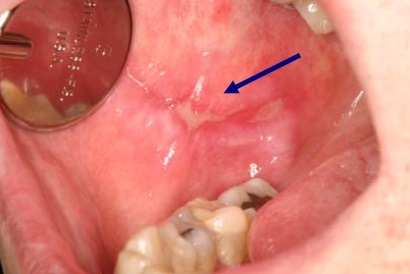 Sometimes ulcers are located within the lesion and surrounded by the whitish lines (see Right). Lichenoid lesions are found most commonly on the mucosa of the cheeks but may occur throughout the mouth. Angioedema: Angioedema is a soft, painless, non-itchy swelling that usually involves the lips, tongue or cheeks. It typically develops rapidly and can become a serious event requiring emergency treatment, if the swelling spreads to the larynx and results in severe breathing difficulty. Erythema multiforme: In erythema multiforme both the skin and the mouth may be affected. 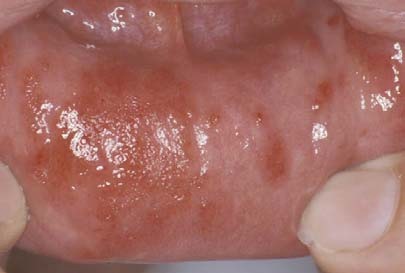 Mouth lesions begin as swelling and redness of the oral mucosa, followed by the formation of blisters which break and leave areas of ulceration. The lips may become swollen and develop bloody crusts. The typical skin lesion is the “target” or “iris lesion” which consists of concentric rings of red skin surrounded by areas of normal colored skin (see Right). The extent of involvement can be so severe as to require hospitalization. Plasma cell gingivitis: Plasma cell gingivitis appears as a bright redness and swelling of the gums without ulceration (loss of skin cells). 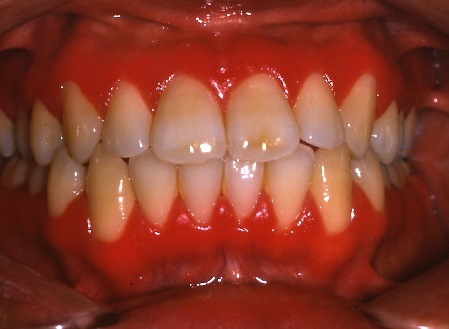 This characteristic appearance (see Right) is due to the gathering of specific white blood cells, called plasma cells, in the gums. Other areas that may be involved include the tongue or lips. This reversible condition is different than gum disease, and symptoms resolve once the cause is removed. Q: What should I do if I think that I am experiencing a hypersensitivity reaction? A: You should seek out a professional evaluation by a dentist or other health care provider to determine the diagnosis and obtain appropriate treatment. Mild allergic reactions are often treated with antihistamine drugs or topical steroids. If you experience difficulty in breathing, you should go immediately to an emergency treatment facility. Q: What can cause a hypersensitivity reaction in the mouth? A: A large number of substances. The most common causes are food, food additives, drugs, oral hygiene products, and dental materials. Q: Are there any specific foods that are more commonly implicated in intraoral hypersensitivity reactions? A: Yes. Nuts (walnuts, cashew nuts, almonds, hazelnuts), fruits and vegetables (banana, avocado, kiwi, mango, tomato, potato), milk, eggs, soybeans, fish (cod, tuna, salmon) and shellfish (snails, mussels, oysters, lobster, crabs, shrimps) are the most commonly implicated food allergens worldwide. Gums and candies are often flavored with agents like cinnamon, peppermint or menthol, which can trigger hypersensitivity reactions in susceptible individuals. Q: What is the “Latex-Fruit Syndrome”? A: A large number of individuals who are allergic to latex products show hypersensitivity to some foods especially fresh fruits. This association of latex allergy with fruit allergy is called “Latex-Fruit Syndrome”. Fruits such as avocado, banana, passion fruit, kiwi, papaya, mango, peach, fig, melon, and pineapple, are all associated with this syndrome. You should inform your dentist if you are allergic to any of these fruits, because of your increased risk of being allergic to latex. Q: Which drugs are responsible for intraoral hypersensitivity manifestations? A: The truth is that almost any drug can cause such a hypersensitivity reaction in the mouth, though some are more common than others. If you suspect you suffer from a hypersensitivity reaction, you should discuss it with your prescribing doctor. Q: Why oral hygiene products are considered as causes of hypersensitivity reactions? A: Virtually any. Many toothpastes and mouthwashes are flavored with potential allergens such as cinnamon, peppermint, eugenol and menthol. Even dental floss and denture cleansers may contain ingredients known to cause a hypersensitivity reaction. Q: How can dental treatment trigger a hypersensitivity reaction? A: Some dental materials used by the dentist can cause a hypersensitivity reaction in certain individuals. Potential allergens include the metals in amalgam (silver) fillings, crowns and bridges, and orthodontic wires; the plastic or acrylic in dentures; composite restorations; bonding agents; impression materials; varnishes; and rubber products such as gloves and rubber dams. Q: The roof of my mouth under my denture is red and burns. Is this an allergy? A: A true allergic reaction to the substances in a denture is uncommon. Your symptoms are much more likely the result of inflammation caused by the denture being to loose or a yeast infection. Q: Can local anesthetics cause allergic reactions? A: Yes, they can, although it is rare. Only 1% of the adverse reactions due to local anesthetics are considered truly allergic, and most of these are due to an allergic response to the vast majority of adverse reactions attributed to local anesthetics are in reality caused by either patient anxiety or as a response to the vasoconstrictor present in the anesthetic solution. Q: How can I determine if I have an allergy? A: It can be a challenge, particularly when you are experiencing mild allergic reactions. Your healthcare provider will often ask if you can identify a relationship between your exposure to a particular food, drug, or other product and the onset of your symptoms. If necessary, your provider may refer you to an allergist for a more comprehensive evaluation. Q: Can I prevent a hypersensitivity reaction from occurring? A: Maybe. The best way to prevent a hypersensitivity reaction is to avoid any agent that provokes it. While this is easy when the causative agent is known, in many cases it is difficult to conclusively identify the causative agent. For example, the foods you eat may contain small amounts of ingredients capable of causing a hypersensitivity reaction.